On 28 august 2015, Nariman Tamimi was forced out of her house arrest imposed on it in her home in the village of Nabi Saleh near Ramallah in the West Bank six months ago. She ran for more than fifty meters with infected her foot by a bullet to get rid of her child Mohammed from the Israeli troops whom tried to arrest him. 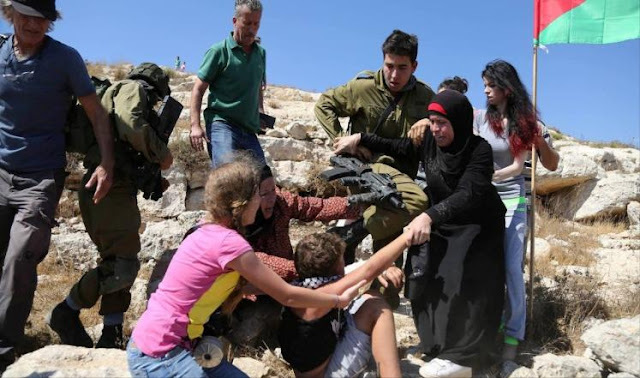 Mother did not think "who joined by her daughter era (14 years) and other women from the village" that this will cause a global sensation and get Israel angry to the point of publishing an arresting threats to the Tamimi family under the pretext of "attempting to attack the soldier." Says Nariman (39 years), he was next to her home on a mission to photograph as of the nature of her work for human rights as a volunteer. And suddenly noticed parents ambush laid by Israeli soldiers to the protesters, but one of them attacked her child Mohammed, 12, while trying to escape. She said, "All I could think of is to rid my son of his arrest as he was already suffering from an injury in his hand"
Nariman exposed and her cousin Nawal also beaten after ridding Muhammad, Salam the younger child (9 years) got wounded too by a metal bullet in the leg, while Ahad the other child of Nariman suffered bruises as a result of the stricken soldier who beat her while tried to free her brother from him.